WESTPORT — The Newman’s Own Foundation has escaped crippling taxes thanks to new federal legislation that protects businesses, like Newman’s, who give 100 percent of their profits to philanthropy. “It would have ripped apart 35 years and $515 million in purpose-driven philanthropy,” Bob Forrester, President and CEO of the Newman’s Own Foundation, said Thursday at a press conference celebrating the legislative win. President Donald Trump signed into law Feb. 9 the Philanthropic Enterprise Act as part of the Bipartisan Budget Act of 2018. The new law allows private foundations to wholly own a for-profit business as long as the profits are dedicated to charity and the business meets certain governance conditions. “This was a provision of the tax code written in a different era to solve a problem that doesn’t exist any longer,” Sen. Chris Murphy said of the 1969 law meant to bar individuals and entities from using the tax code to shelter their commercial earnings from taxation through philanthropies. For years Newman’s Own and other groups had received a waiver to the tax law that was to expire this Fall. The original law likely did not anticipate the 1982 birth of Newman’s Own, a food products company that donates 100 percent of its profits to nonprofit organizations around the world via the Westport-based Newman’s Own Foundation. More than $500 million has been donated to nonprofits around the world from the sale of Newman’s Own products, such as salad dressings, pasta sauce, and lemonade, through a novel business-philanthropy model protected by a string of IRS extensions which have allowed the company and foundation to remain in partnership. If the extension expired in November, as planned, and the new legislation not pushed through by Senators Murphy and Richard Blumenthal, the foundation would have to divest 80 percent of its holdings in the food company, from which the foundation derives its funding, and the foundation’s remaining 20 percent share in the company would have endured a 200 percent tax, effectively putting the foundation out of operation. “I feel tremendous relief,” Ingrid Milne, chief financial and operating officer for the Westport-based nonprofit SeriousFun Children’s Network, which organizes camps for children with serious medical conditions, said of the philanthropic enterprise legislation. 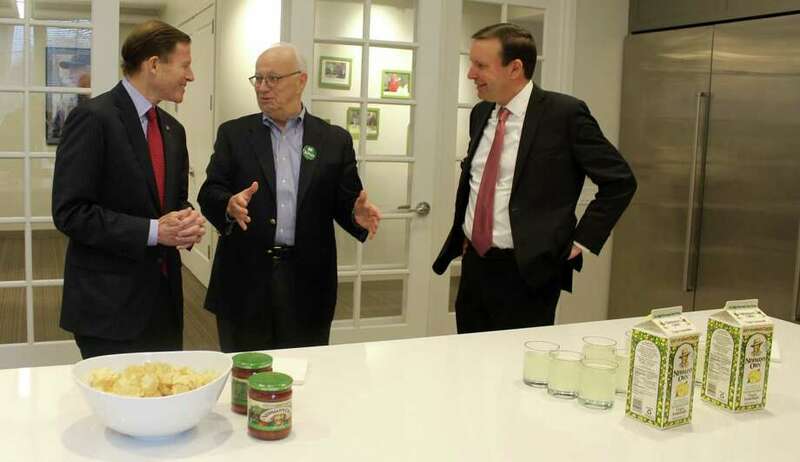 Milne joined Newman’s foundation employees on Feb. 22 at the foundation’s headquarters to celebrate the new legislation with Senators Murphy and Blumenthal. “It was really worrying because Newman’s Own has been instrumental in supporting the camps, which get a significant portion of their funding from Newman’s Own. It would really have impacted the ability to serve the children with serious illness, so we were extremely relieved and thankful this passed so the great work can continue,” Milne said.